The sky suddenly began to glow a beautiful variety of colors, possibly attracting the attention of every known dragon on Pyyria. It was almost as if Phantom had thrown up on the cosmos and then had cut herself and had splayed all her blood all over the place. Alright, maybe that's not what happened, but it's still funny to imagine. What had really happened was there had been recent activity of wormholes in the area. The same wormholes that had brought the pokemon into this universe. But now it was bringing something totally different. A human. But since Shardas didn't want this human to be, well, human, he transformed him. He changed the human to dragon. Suddenly, the wormhole spewed out an 18 foot black and white dragon with white stripes on his head and a white skull on his chest. After a moment he lay completely still, then he stirred, slowly getting onto his feet. He was wobbly, almost as if he had never used his legs before, and looked completely and utterly confused. He was still pretty dizzy, so he couldn't tell exactly where he was. Behind him, the wormhole made more spewing noises, almost as if it was going to shoot another dragon out. But instead it started glowing brightly before finally disappearing. Phantom really needed to do something about all these crazy wormholes popping up all over the place. The dragon, named Death the Kid, looked dizzily down at his paws. His eyes widened and he stepped backwards. He looked over at his back and noticed his wings and tail. After a moment of stunned silence he spoke, "Wah-whe-huh?" he seemed very confused. Gemini, who had seen the bright thingy, whatever it was, had come flying over, to inspect what it was. She stopped at the sight of a dragon with a white skull on his chest and strange white lines that only went halfway across his face. "..... Hi?" she said slowly. 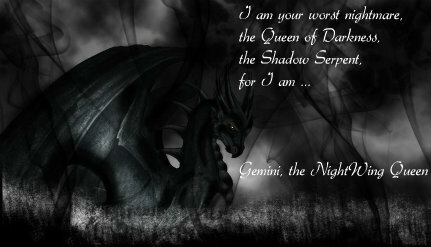 "I'm Gemini, the Goddess of Death. And you might be?" She sniffed him a bit. "Hmm .... you seem to have the smell of death. Are you like .. a grim reaper or something? You sure smell like one." She sat back on her haunches and crossed her arms. "Well?" Corrode, being the ever-vigilant Deputy that he was known to be, was immediately intrigued by the strange cosmic phenomenon happening in the sky. He patiently observed something come streaking out of it, and then waited to see if anything else would happen. After it was all over, Corrode sighed, and exited the site of the Earthwing's city, intent on finding out what the disturbance was. He might have been immense, even for an Earthwing, but his ancient wings carried him over to the "crash site" faster than most other dragons. He made a pass overhead, and saw the odd, new dragon and none other than Gemini herself. He came down for a landing next to Gemini, nodding his greeting to her. "It's always a pleasure to see you, Gemini. What's going on here?" He asked her, and directed his eyes towards Death. "Is it another from the stars? It's strange times we live in..." He muttered. As Kid tried to stand on his legs, he failed and tumbled forward, grunting. He may still be bipedal but these wings were really throwing off his balance. In fact, Kid didn't even know where he was, let alone what he was. Little did he know he had landed in NightWing territory, home to giant black dragons. Kid didn't even know he was a dragon. 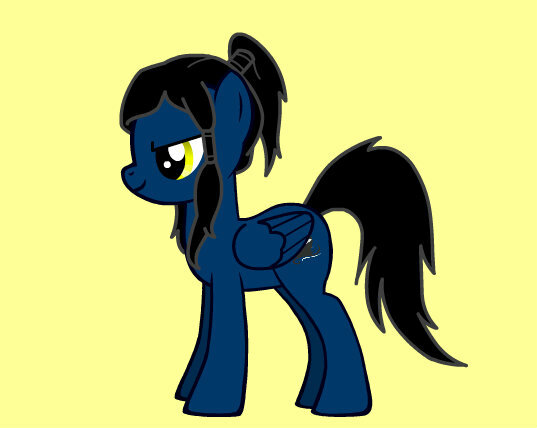 He shook his head again and glanced around, his wings out stretched by his sides as he tried to keep his balance. The shinigami faintly remembered what had happened before he had shown up here. He had been walking down the street with Liz and Patty when suddenly a rainbow wormhole thing had appeared out of nowhere. Then everything had gone dark. "Kid, aren't we suppose to be heading to the DWMA?" asked Liz as she walked alongside Kid. He had brought them on some kind of detour. Liz suspected why but she couldn't be certain. Kid glanced back at her, his hands in his pockets, "We are simply taking a detou-"
Suddenly, a figure dashed out of the shadows and tackled him, sending them both to the ground. For a moment Kid struggled, then he realized who the figure was. "Galaxy!" he exclaimed, rolling onto his back and looking at the brunette, who was giggling at him, "What are you doing here?" Liz smirked. She knew Kid knew that Galaxy had been here. Ever since they had found the strange Weapon Kid's partners had known the two had a crush on each other. Recently Galaxy and Maka had been getting into fights, and no one could determine why. Well, no one except Kid, who knew Galaxy's secret. "To come see you, silly!" replied Galaxy, helping Kid up. She was absolutely perfect, out and in her weapon form, Kid thought. But that wasn't the only reason Kid liked her. "Galaxy I-" Kid began to say, when suddenly Galaxy's eyes widened and she pushed him out of the way. Patty and Liz jumped out of the way as well, and out shot a glowing entity. It was shaped like a dragon. It spun around and growled at the four. "Liz, Patty, transform!" said Kid as he stood up. Liz and Patty nodded and soon transformed into two guns in Kid's hand. Galaxy made her hands transform into two silver-black swords. Kid started shooting the glowing entity(The glowing entity is Phantom btw! ) while Galaxy charged at it, her swords glowing with energy. As she jumped at the dragon, she was suddenly thrown back by an invisible force, smashing into the wall. Kid was distracted by this and suddenly the dragon tackled him. From here everything went black. Remembering this, Kid looked around. He didn't see Liz or Patty anywhere, so he must of either dropped them or they were thrown somewhere else. Then he heard a noise, and spun around. A huge black and purple dragon walked out of the shadows, almost as if she had materialized out of nowhere. Instinctively, Kid backstepped and stared at the giant black dragon. She seemed to be looking at him curiously. When she asked who he was and commented on his smell, he stood as straight as his new body would allow and said. "Yes, I am a Grim Reaper. I appear to be ... well, lost..."